Samsung Galaxy S5 has been released on April 11, 2014. This is a tutorial intended to help free convert DVD to Galaxy S5, of course, with the aid of the best free DVD to Galaxy S5 ripper. It also applies to free DVD to Galaxy S/Note ripping, free DVD to iPhone/iPad/iPod converting, etc. 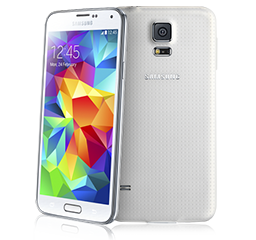 As you can see, we focus on Best and FREE DVD to Galaxy S5 ripping tool. Join us if you are in need of it too. You might want to go directly to the next DVD to Galaxy S5 free converting part, but before that, let's get some specs information about Samsung's latest flagship smartphone – Galaxy S5, which was unveiled at MWC 2014, in case some of you are not very clear about what the data mean for your HD DVD movie enjoy, or you are still of two minds about whether to rip DVD to Galaxy S5 or just get an external drive. Conclusion: On the plus side, we have to say, Samsung Galaxy S5 with bigger sharper display and longer battery life, is specially tailored to HD DVD video enjoyment, despite its design flaws, which have nothing to do with video watching. But one thing is certain that portable devices have no DVD drive, and Galaxy S5 is no exception. To convert DVD to Galaxy S5 with a best free DVD to Galaxy S5 ripper or pay to play DVD on Galaxy S5 with external drive, it's up you. How to Rip DVD to Galaxy S5 Free? WinX DVD Ripper - Free Rip any DVDs to Samsung Galaxy S5. Before you make your decision, take a look at this simple-step DVD to Galaxy S5 ripping process. Maybe a best free DVD to Galaxy S5 ripper is exactly what you want. Here we use WinX DVD Ripper, a fully featured and free DVD ripping software, to do the DVD to Galaxy S5 converting presentation. Step 1: Insert your source DVD and load the DVD content by clicking "DVD Disc". Step 2: Select an output video format. Choose "to Samsung", and then "Galaxy S" in the drop-down box. Note: From the main interface you can see that this DVD to Galaxy S5 best free ripper is also capable of helping rip DVD to WMV, DVD to MP4, MPEG, FLV, MOV, iPhone, iPod, Apple TV, HTC etc. for your DVD playback need on various mobiles. Step 3: Choose an output folder. Step 4: Press button "Start" and this best free DVD to Galaxy S5 converter starts working at a really fast speed. 1. Absolutely free and clean. No malware, adware, virus or something like that. 2. No matter you want to backup DVD to hard drive for preservation or rip DVD to popular gadgets for playback, this free DVD to Galaxy S5 ripper is the best option. 3. Good at dealing with copy protected DVDs (not all). For users trying to rip Disney protected DVDs, the upgraded version of best free DVD to Galaxy S5 ripper - WinX DVD Ripper Platinum is highly recommended. 4. Fast DVD ripping speed and perfect output video quality. Anyways, I am loving this software very much and I cannot say how amazing it works and how grateful I am. Especially when I plan on traveling soon and I can enjoy my DVD movies and shows on my Galaxy 5S. 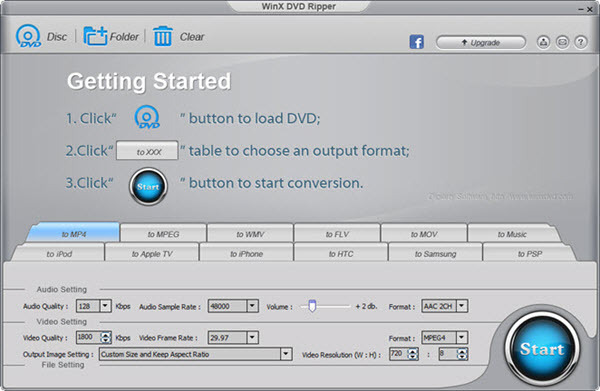 If you need to fast rip DVD to MP4, WMV, MPEG, iPhone, iPad, Android/Microsoft tablets, smartphones and so on, please turn to WinX DVD Ripper Platinum.